Prepare a clean brood box filled with frames of foundation. Place this box over the existing brood box. Unless there is a strong nectar flow feed with winter strength sugar syrup i.e. 1 Kg of sugar to 650ml of water. When the bees have drawn out some of the foundation, find the queen and place her on this comb. Put a queen excluder over the old brood box and under the new, thus trapping the queen in the upper box. If possible arrange a new hive entrance between the two brood boxes and close off the old. This helps to reduce the amount of pollen stored in the old lower combs. After three weeks, remove the old brood box. The brood will have hatched and the comb can then be rendered to recover the beeswax. 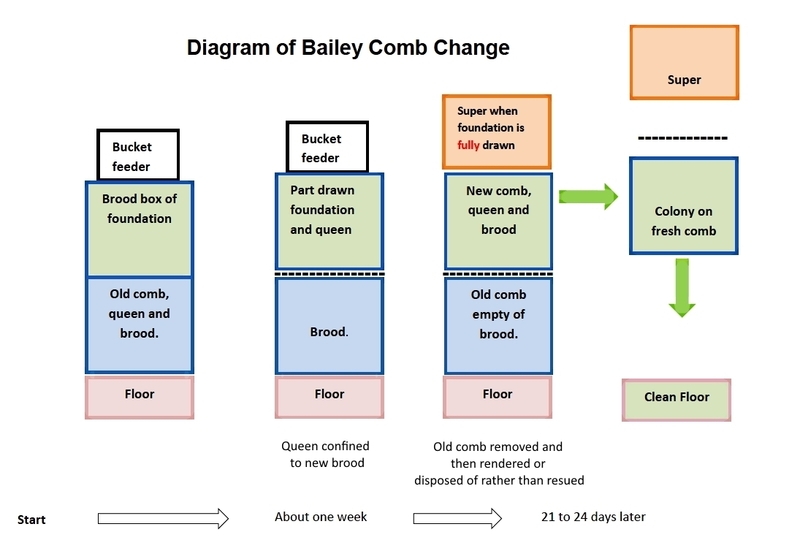 This system is ideal for replacing all the combs at once and is best performed in early spring often, with clement weather, March is suitable, but remember to keep feeding so the bees can build comb.